Winter excursions can seem like a big feat for those new to the cold weather terrain. From hiking gear, to chains or special tires for your car, to the layers of clothing, it may seem like a lot to acquire for a peaceful time in the backcountry. Start by planning out how many miles you want to accomplish, and then plan the gear from there. The snowy terrain, ice caps and elevation changes all make a difference when deciding what gear to pack along. We have all seen the famous YouTube videos of people slipping and sliding on their driveways through difficult – and sometimes hidden – ice patches. While this may be funny when you are close to home, slipping in the backcountry can lead to a dangerous situation (especially if you have a 70 lb. pack on!). Lightweight microspikes are a great item to carry with you if any ice is to be expected on the trip. Microspikes can easily slip over your hiking boot and will dig into the packed snow as you walk. These “spikes” are typically only in the ¼” and ½” range. Easy to slip on and off as you hike, take all precautions necessary to NOT go sliding backwards! A backpack to carry your gear – such as a water bottle, snacks and those microspikes we just mentioned – are all essentials to carry with you. Keeping the important items safe and secure in a waterproof bag is a great way to feel confident on the hike. Whether it is actively snowing, or you set the bag down on the ice, a waterproof bag will keep everything inside nice and dry. The Animas Backpack is a great waterproof option to keep you hands-free throughout the journey. Equipped with a waist strap to provide a sturdy carry and padded shoulder straps for each comfort this bag has everything you need for a day-hike or 2-3-day trip. The Watershed Drybags ZipDry Closure System ensures the bag stays airtight no matter what! Accessories such as hat, gloves, base layers are all essential in the frigid weather. The layers may seem like extra weight if you are backpacking, but you will be happy when the sun sets and the temperature drops. The outdoor industry has done an amazing job making winter gear as light as possible (for a price of course). 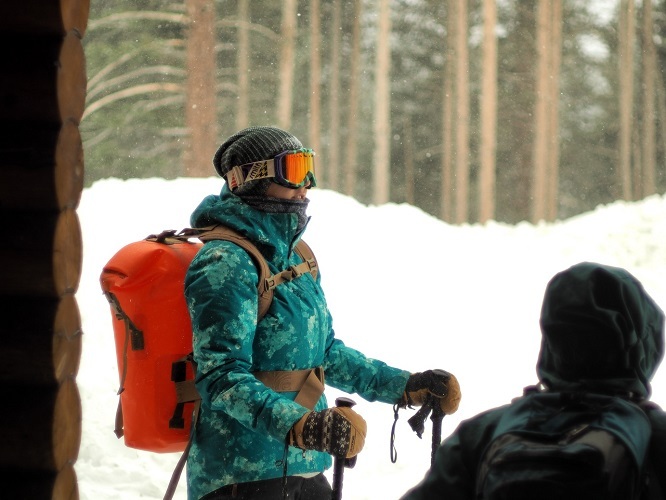 A down jacket, light weight base layers and a buff are all great items to take on a hike. Trekking poles are a great item to have year-round. We love gear that can be used in all seasons as opposed to being shoved under the bed for half the year. In addition to the microspikes, trekking poles will help you stay upright and distribute your body weight evenly. Using your hands and your leg strength to climb a mountain can be a life-saver for your leg muscles! Recent design breakthroughs, like the folding trekking pole, have pushed the total weight of some models to well under a pound. Perfect for backpacking! Hiking to the top of a mountain only to be blinded and unable to view the mountain peaks comfortably is not an ideal situation. Snow can be extremely dangerous to your eyes when the sun is casting a blaring reflection. Upgrade your eyewear to make sure you can see clearly on the route will still being protected. 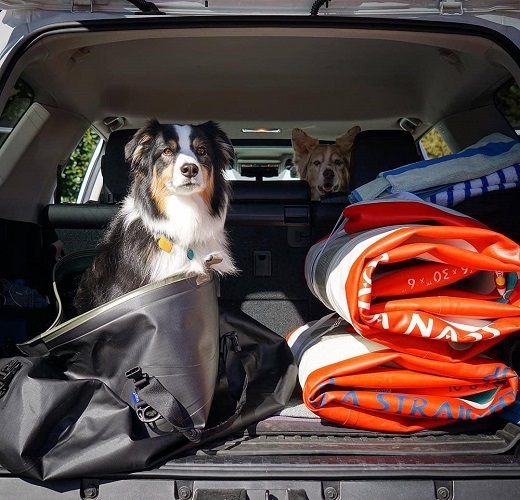 TIP: Taking the pup with you to a mountain peak or up to a higher elevation? Check out some possibilities for ski goggles for dogs. The snow hurts their eyes too! Stay safe and be prepared for an unexpected snow storm or quick change in the weather. 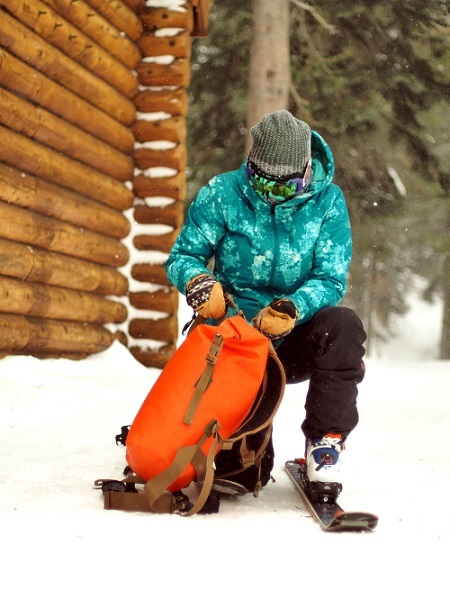 The Colorado Duffel Win’s Editor’s Choice Award! Which Bag is Right For You?